A customer has a nice little Honda Accord. He brought it in because he was going to take a road trip and drive down the Highway 101 to California. We discussed the timing belt. He decided to go ahead and replace the belt. We took the timing cover off and found that the belt was actually shredding inside the cover, and barely hanging together. Based on the look of how that belt was shredding, he had a really high chance of that belt breaking while he was on the road. We are so glad he decided to have this service done before he got out on the road! Why are timing belt jobs so important? This job really has to do with how and where the timing belt is located under the hood. 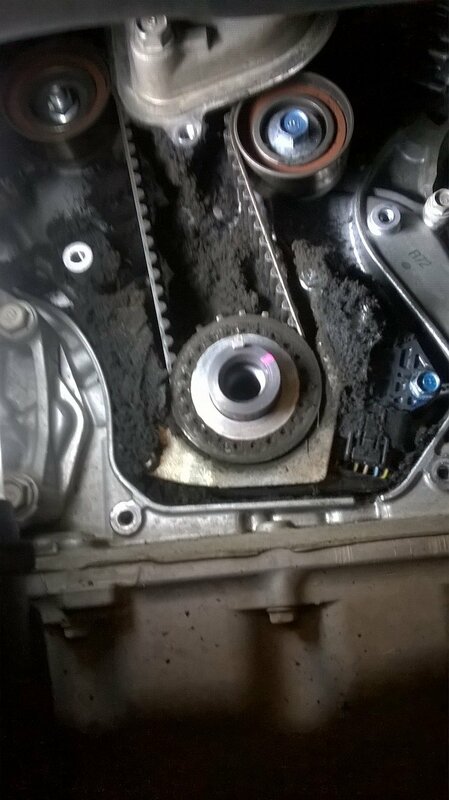 What you have to do is remove the timing cover and then the belt in order to see and assess the state of the belt. We know this is a big job, and it’s on the spendy side in terms of maintenance too. So we do something a little bit special here: we put a sticker on the cover in the engine compartment noting when it was done here at this shop. Now, not every shop dealership does that. If you had this service done somewhere else, we are happy to put a sticker up for them, based on the paperwork. So if a customer has their records and says, “Oh I just had that done last month,” we’ll definitely want to note that on the cover since there’s no other way to be able to tell. As we mentioned before, the timing belt is down in the workings of the car and has a cover to protect it. You can’t just pop the hood and be able to tell the state of the timing belt just by looking. What else needs to get done once you’re sure you’re getting your timing belt replaced? You’ll want to maximize the work that gets done once you’re down in that part of the vehicle. This includes replacing the water pump, camshaft seals, crankshaft seals, and serpentine belts. You’ll want to consider replacing all of the tensioners and the idlers when replacing a timing belt too. Both have an influence and affect the timing as well. The risk that you take is if you don’t replace them when you do the timing belt, if it goes bad in a month or two, you’re going to be paying for the time to get down into that part of the vehicle again. Most manufacturers advise based on mileage and time. Belts are usually made from reinforced rubber with tripled fibers. These, when they wear out will usually tear before they crack. Here’s a surprising thing about timing chains: Your oil (yes, motor oil) is really important for maintaining the timing chain. Keeping the oil in your car as clean as possible is a really important part of maintaining the timing chain, (if your vehicle has one), in addition to the oil performing as a lubricant. What about timing belts on a used car or truck? Let’s say that somebody got a car that they’ve bought as new to them, what can they do regarding timing belt or chain knowledge? Before you purchase the vehicle, you should ask if the timing belt has been replaced. If it has been done, ask for the receipt (and all of the records) for the work. Now, this is really important: A lot of times people will sell their cars right before the timing belt needs to be replaced. They don’t want to repair it because it’s a big job, right? And the bad part is, when a timing belt breaks, the damage is… usually pretty severe if it doesn’t completely total the car. You don’t want that situation. If the seller can’t produce a receipt, you really should assume that the work has not been done. No matter how nice the person seems or what they say to convince you. This is an important maintenance job. You want to be proactive and replace the timing belt. What happens when a timing belt or chain breaks while driving? Usually, timing belts and chains break while at a higher rate of speed, frequently freeway speed. When a timing belt goes, it pretty much turns the car off without warning and on a lot of vehicles it can bend valves and damage the engine. Bottom line, if you’re not positive when your timing belt is due to be replaced, find out. If you’re not sure if it has been done, you should probably do it. And of course, we are always here to help!